Eleven drivers lined up to go head to head over twelve tests on the good tarmac of the main carpark at Pirelli during the plant being on summer break. The 11am start got things going as a full entry of 20 had been hoped for, but those that did take part enjoyed themselves. Caroline Lodge & Michael Lindsay were armed with there stopwatches and kept the track busy as one car finished another started. 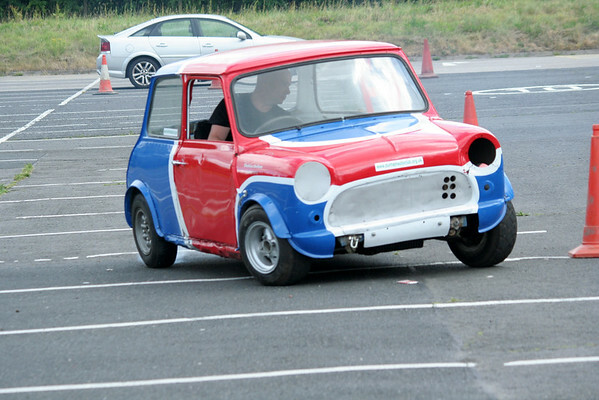 Test 1, Tony Crisp had brought his Autotest mini over from Durham along with Son Jonny with his Ka for his second appearance at a SMC Autotest. Tony flew round the course in a time of 49 sec. 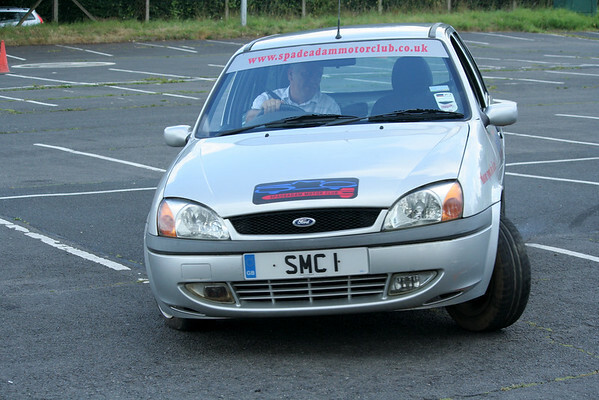 Stephen Dixon was the quickest of the SMC members with 53 sec in his stripped out Corsa. Geoffrey Harkness & Barry Lindsay were close behind on 54sec. Test 2 was a re-run over the same course, Tony was again quickest with 51sec with Stephen & Barry just behind on 52sec then Geoffrey on 53. 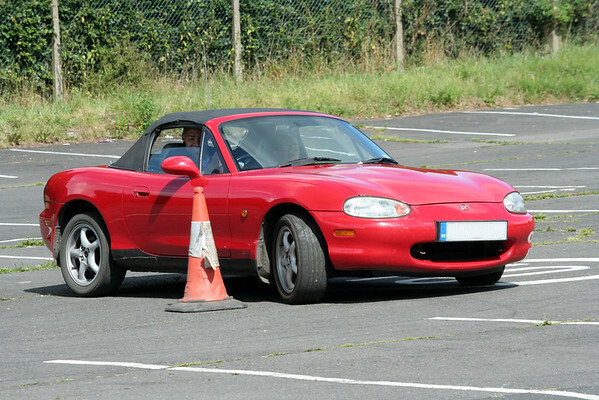 Test 3 Moved a few cones then was quickly underway after a walk round. Barry fought back with the old 106 getting 42, ahead of Geoffrey on 43, John Ross got 44sec using the club car Fiesta then Stephen, Tony & Jon Stynes now with a Mazda all getting 45sec. Test 4 was the same test. Barry quickest with 41sec, Stephen & Tony on 42sec then John & Geoffrey on 43sec. Test 5 was a new layout, Tony got 51sec followed by Stephen on 52sec, Barry on 54sec then Jonny Crisp in a well turned out Ka on 55sec. Test 6 was the same test, Stephen went quickest getting 51sec Tony got 52sec, Barry 53sec then Jonny on 54sec. First wrong test of the day was newcomer Nkem Eronini. 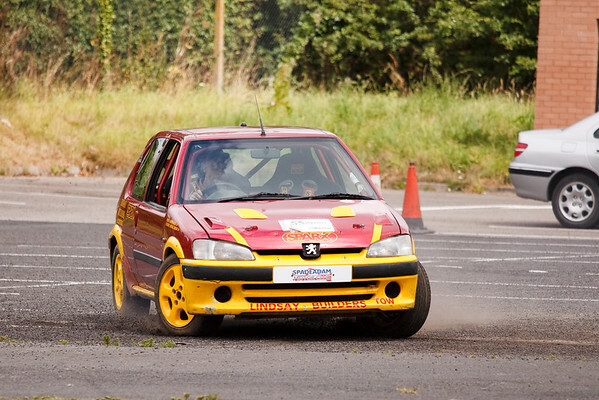 Nkem had won a free entry when Spadeadam donated the entry to a draw on the Go Motorsport stand at the Pirelli Rally. Test 7 Tony was quickest with 1m06, Stephen on 1m08, Barry on 1m 15sec then Nkem on 1m19sec trying to fight back. On the re-run as Test 8 Stephen got 1m06, Tony 1m07, Jonny on 1m11sec then Geoffrey on 1m16sec. Test 10 was the same. Barry went quickest with 1m05sec, Tony on 1m07, John R on 1m08 then Geoffrey on 1m10. Stephen had gone wrong but realized and corrected himself but vital seconds were lost with a time of 1m16sec. Jonny got a wrong test on this one. Test 11 was the first run of the head to head where two car set off on the drop of a flag doing two courses set out parallel to each other. Tony was quickest on 39sec, Stephen & Barry both got 45 then John R on 48sec. Kieron Stynes got a wrong test. For the final test Tony was again on form stopping the clocks with 40 sec, Stephen on 42sec, Geoffrey on 45sec the Barry on 46sec.